Mencía is a red grape variety, mainly grown in northern Spain with additional plantings in central Portugal. 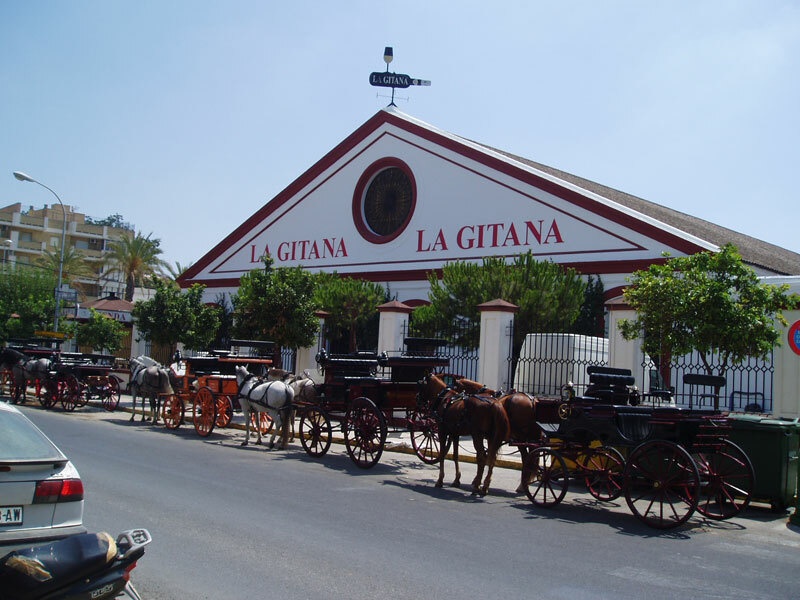 It is known for producing nicely acidic, moderately tannic red wines. If that is all that you know about Mencía, you are doing pretty well! However, if you’d like to learn a few more fascinating facts about Mencía, please read on! 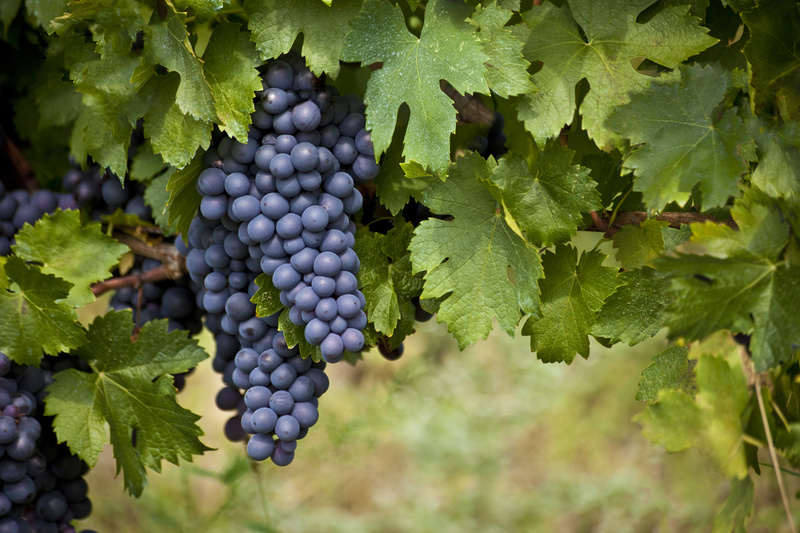 #2: It was once thought that Mencía was the same grape as—or closely related to—Cabernet Franc. However, modern DNA testing has proven that Mencía and Cabernet Franc are not particularly closely related. Mencía is, however, identical to a Portuguese grape known as Jaen—aka Jaen du Dão. It is possible that Mencía is native to the north of Spain and spread from there to Portugal’s Dão Region—perhaps via pilgrims trekking home from Santiago de Compostela. However, it is also possible that it originated in the Dão and later made its way to Spain. #3: These days, Mencía is best-known as the main grape of Spain’s Bierzo DO (located in the region of Castilla y León), where it accounts for nearly 75% of the vine acreage. Mencía is also grown in Galicia (Spain) in the Valdeorras DO, Monterrei DO, and Ribeira Sacra DO. In Portugal, it is grown in the Dão, Lisboa, and Beira Interior Regions. #4: In the not-too-distant past, Mencía was primarily grown in the fertile, rain-abundant plains and valleys of Portugal and Galicia. These plantings produced high yields, which were in turn used to produce large volumes of high-acid, fruity, quaffable wines often compared to certain lovable-but-not-serious versions of Beaujolais. As these things usually go, there certainly were a handful of quality-minded producers all along, and the idea of ultra-high quality Mencía was fully realized when—in the 1990s—Alvaro Palacios came to town. Palacios, already famous for creating ultra-high-quality wines in Priorat, began to produce Bierzo DO wines from 40-to-60-year-old Mencía vines grown on the well-drained soils of the area’s hillsides. 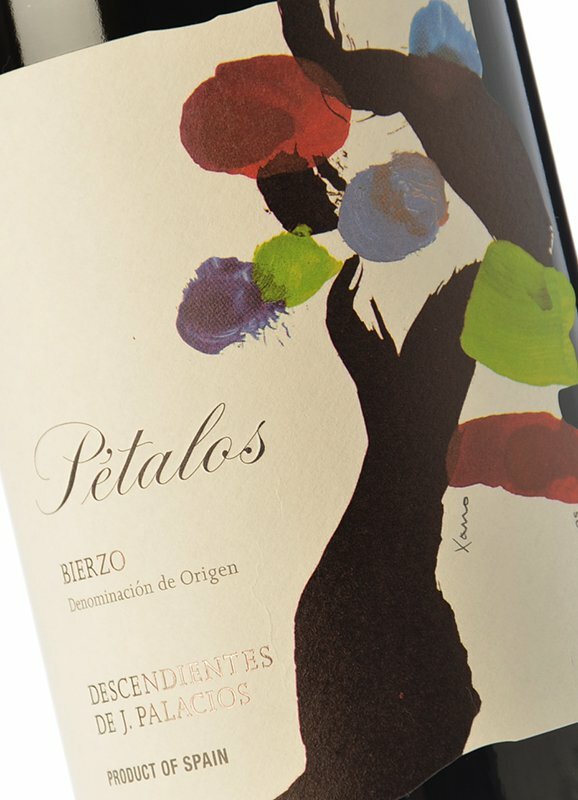 The resulting wines, now produced by Descendientes de J. Palacios, are rich, concentrated, serious wines (including some single-vineyard bottlings that can fetch prices of $500 a bottle or more). 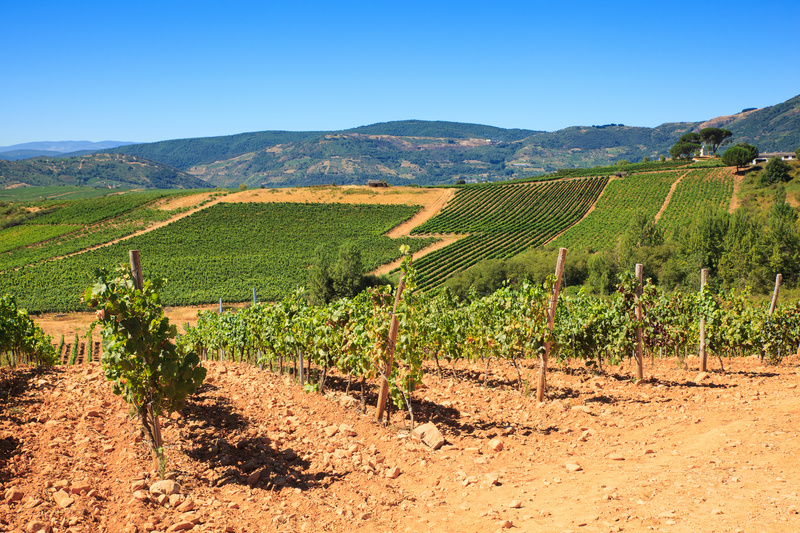 Other top producers of hillside-grown Mencía include Dominio de Tares, Casar de Burbia and Castro Ventosa (whose holdings include a pre-phylloxera Mencía vineyard planted on the only sandy soils to be found in Bierzo). #5: Quaffable wines produced from the Mencía grape variety will be pleasant enough and have a nice cherry-red color, good acidity, and moderate tannins as well as aromas of strawberry, raspberry, cherry, and pomegranate with some floral undertones. Lower-yield, higher-quality Mencía can show all of the above as well as hints of licorice, black pepper, and a whiff minerality—often described as a “gravel-like scent”. These wines can be deep red/violet in color, rich in meaty tannins, and as age-worthy as the finest Pinot Noir. According to the latest figures, there are about 25,000 acres (10,100 ha) of Mencía in Spain, as well as about 7,000 acres (2,835 ha) in Portugal. Robinson, Jancis and Julia Harding: The Oxford Companion to Wine, 4th Edition. Oxford, 2015: The Oxford University Press. 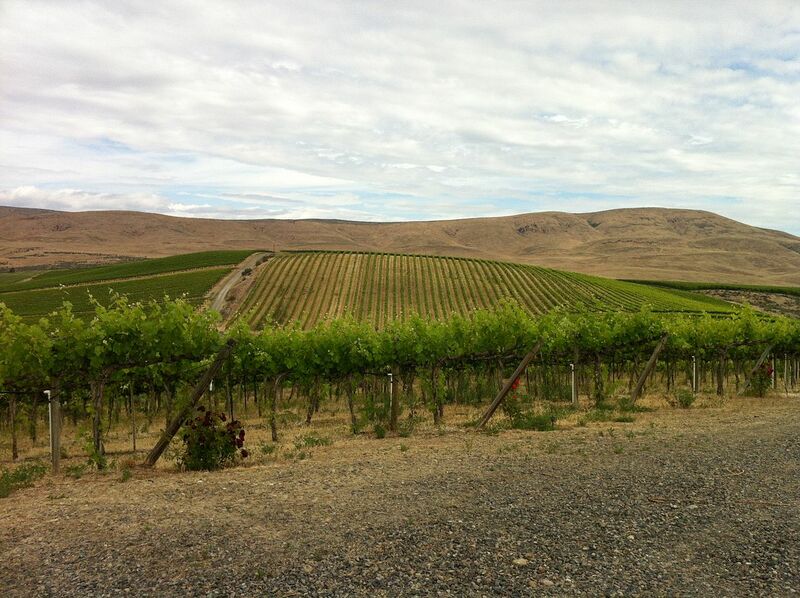 Here’s five fast facts about the beautiful, historic, and tourist-friendly Yakima Valley AVA. Time to plan a trip! 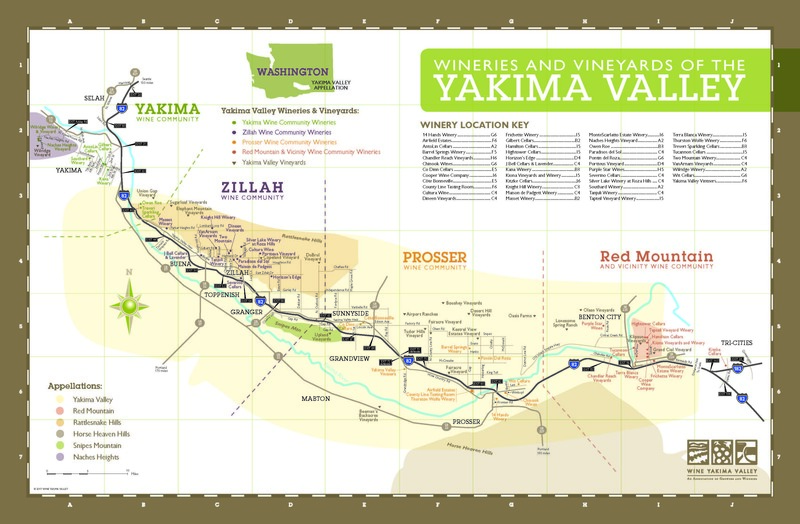 #1: The Yakima Valley was the first AVA in Washington State: In April of 1983, the Yakima Valley AVA was the first AVA established within Washington State (the larger Columbia Valley AVA was established about a year-and-a-half later, in November of 1984). The Yakima Valley area is home to some of the oldest vineyards in Washington State, with winemaking in the area going back as far as 1869. The first vines in the area were planted by Charles Schanno, a winemaker from the French region of Alsace-Lorraine. Later, in the early 1900s, an attorney from Tacoma named William Bridgeman planted vineyards and pioneered irrigation in the area. Following Prohibition, Bridgeman opened Upland Winery and—along with winemaker Erich Steenborg—began producing varietally-labeled wines in the Yakima Valley, including the state’s first dry Riesling. Red Mountain: the smallest AVA in the state, located on the south/southeast slope of Red Mountain facing the Yakima River, and a powerhouse area for Cabernet Sauvignon. Snipes Mountain: the second-smallest AVA in the state, located in the southeast corner of the Yakima Valley atop a ridge including the peaks of Snipes Mountain and Harrison Hill. This is the area where William Bridgeman’s original winery, Upland Winery was located; the original property (now owned by the Newhouse family) is a large working farm—Upland Estates—complete with an area known as Upland Vineyards. Rattlesnake Hills: The Rattlesnake Hills AVA is located to the north of the Yakima River, along an expanse of hills running from east-to-west. The vineyards here are found at elevations ranging from 850 feet and rising as high as 3,085 feet. Candy Mountain—the one on-the-way: In January of 2017, the TTB accepted an application for the proposed Candy Mountain AVA, to be located in the far-eastern part of the Yakima Valley, to the east of Red Mountain. If accepted, Candy Mountain will be the smallest AVA in Washington State. #3: The Yakima Valley is known for Chardonnay, Cabernet Sauvignon, Syrah, Merlot, and…hops: The leading grape varieties of the Yakima Valley (listed in order) include Chardonnay (at 3,180 acres), Merlot (at 2,090 acres), Cabernet Sauvignon (at 1,350 acres), Riesling (at 920 acres), and Syrah (at 650 acres). In addition to grapes and wine, the Yakima Valley is a major producer of apples, cherries, pears, and hops. 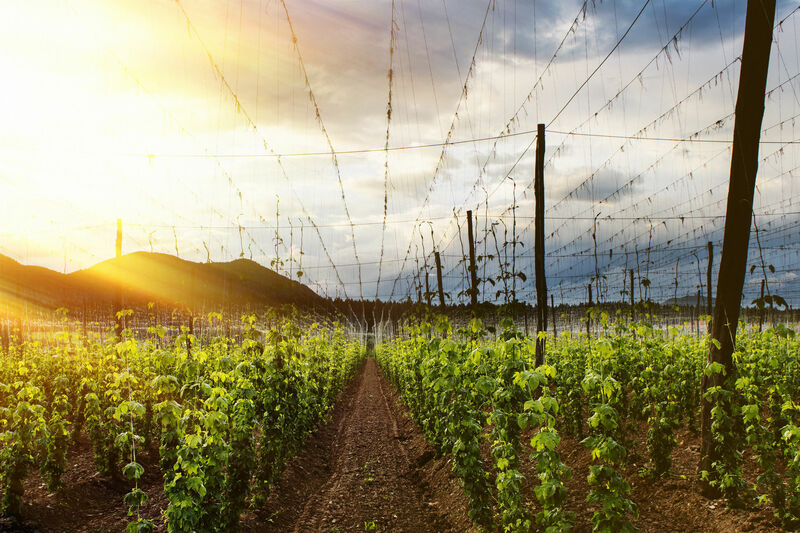 The Yakima Valley contains more than 75% of the total hop acreage in the country and accounts for 77% of all hop production in the US. #4: There’s a movie about it: It’s not quite Sideways, and I’m not sure the powers-that-be in Yakima Valley want to go shouting it from the rooftops, but there is a funny, semi-wine related and very charming movie set in the town of Prosser, smack in the middle of the Yakima Valley. It’s called “Cement Suitcase” and stars Dwayne Bartholomew as Franklin Roew. Franklin is a semi-slick wine salesman at a local tasting room, smack in the middle of a quarter-life crisis complete with a cheating girlfriend and a goofball roommate (as well as some unresolved grief about the recent death of his mother). It’s a great film to watch on the plane en route to your winetasting tour of the Yakima Valley. Cement Suitcase was directed by J. Rick Castañeda as his first feature film. 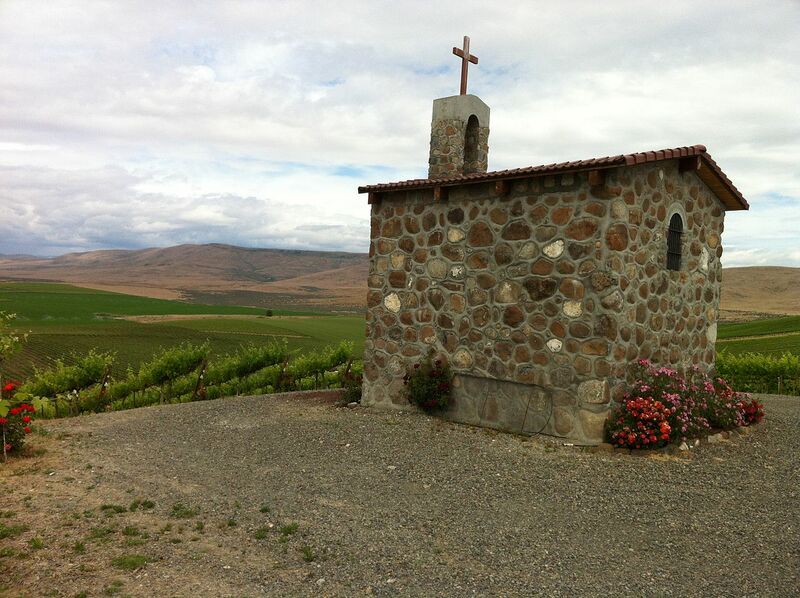 #5: The Yakima Valley has its own hilltop stone chapel: The historic and renowned Red Willow Vineyard, located in the far western part of the Yakima Valley AVA, has its own hilltop chapel. Built from stones collected during the original planting of the vineyards, the chapel is built at the apex of the Chapel Block of the Red Willow Vineyard at a height of about 1,250 feet. Is it weird that tartaric acid has been on my mind a lot lately? I suppose dreams of tartaric acid are not so unusual for those inclined to the study of wine, and a little bit of a treatise on tartaric might be just the ticket to soothe my soul. So here goes, five fast facts about tartaric acid! #1: When it comes to tartaric acid, grapes rule: Tartaric acid is one of the main natural acids found in grapes and —interestingly enough—grapes have a higher concentration of tartaric acid than any other fruit or vegetable. Besides grapes, measurable quantities of tartaric acid can be found in avocadoes, bananas, cherries, and grapefruit. However…for the record, most fruits and vegetables—including blackberries, blueberries, apples, apricots, peaches, pears, pineapples, plums, lemons, limes, oranges, and tomatoes—are high in malic acid and citric acid, but contain very little (if any) tartaric acid. #2: Tartaric acid is tongue-tingling and truly tart: Tartaric acid is typically the strongest acid in both grapes and wine, as measured by pH and volume. Tartaric acid typically accounts for one-half to two-thirds of the acid content of ripe grapes. As such, tartaric acid is one of the most important fixed (non-volatile) acids in wine, along with malic acid. #3: Tartaric acid is strong and stable, part one: Tartaric acid is often used as an additive in winemaking (for good reason): In addition to the obvious impact on taste and flavor, proper levels of tartaric acid are important to the microbial stability of a wine. Tartaric acid resists decomposition and microbial attack, and is therefore often used as an additive when acidification is needed. Malic acid, on the other hand, is easily broken down by malolactic fermentation or other processes. 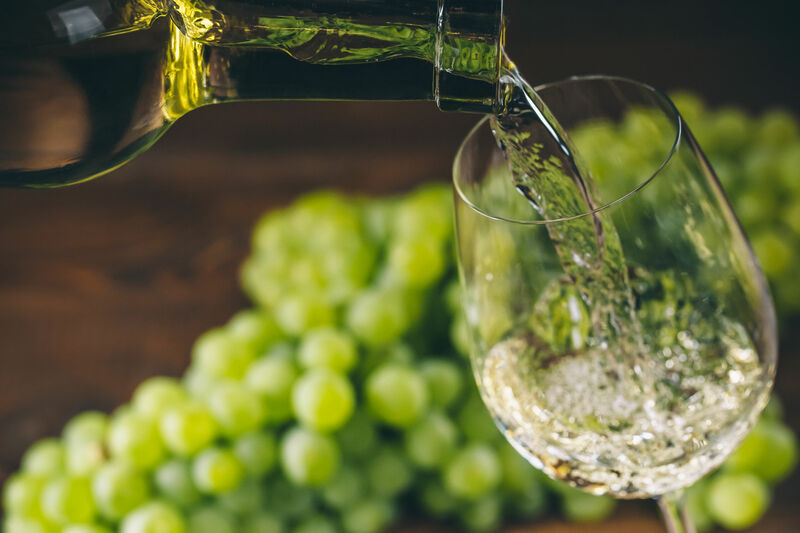 For these reasons and more, tartaric acid is the substance most often used when acidification is needed in the winemaking process. 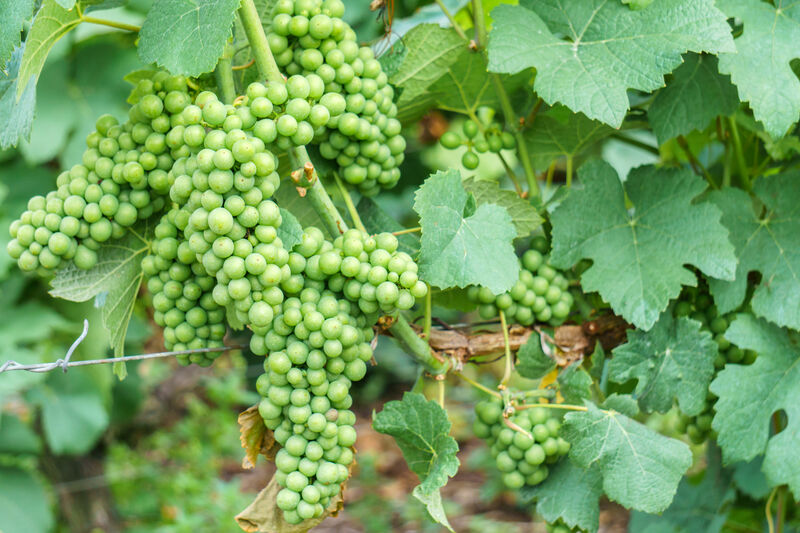 #4: Tartaric acid is strong and stable, part two: Tartaric acid typically is contained in wine grapes at a concentration between 2.5 to 5 g/L at harvest, and it remains relatively stable throughout the ripening process. Conversely, wine grapes often contain more than 20 g/L of malic acid prior to veraison—however, a good deal of this is used for energy during respiration. Levels of malic acid at harvest are typically closer to 1 to 4 g/L. Tartaric acid is also metabolized during respiration, but at much lower levels than malic acid. #5: Tartaric acid is related to, but not (quite) the same thing as cream of tartar: Students of wine are sure to be familiar with the propensity of tartaric acid to form wine diamonds (particles that separate from the wine and look like tiny crystals of rock salt). Wine diamonds can form in the tank, during barrel aging, or in the bottle—particularly if the wine is subjected to cold temperatures. Tartrates can be prevented in the bottle via pre-bottling cold stabilization. Tartrate crystals scraped from the interior of oak barrels once inhabited by high-acid wines can be used to produce cream of tartar—a white powder that is often used as a stabilizing or leavening agent in cooking (particularly with egg whites, sugar work, or baking). Cream of tartar is basically partially-neutralized tartaric acid, produced by combining tartaric acid with potassium hydroxide. Cream of tartar, when used in baking, helps to activate baking soda, which is alkaline. 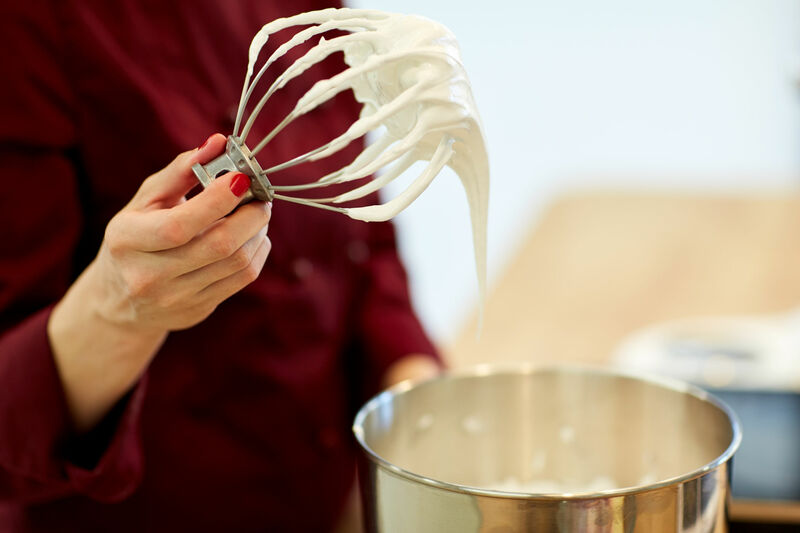 As a matter of fact, cream of tartar combined with baking soda is the formula for baking powder. 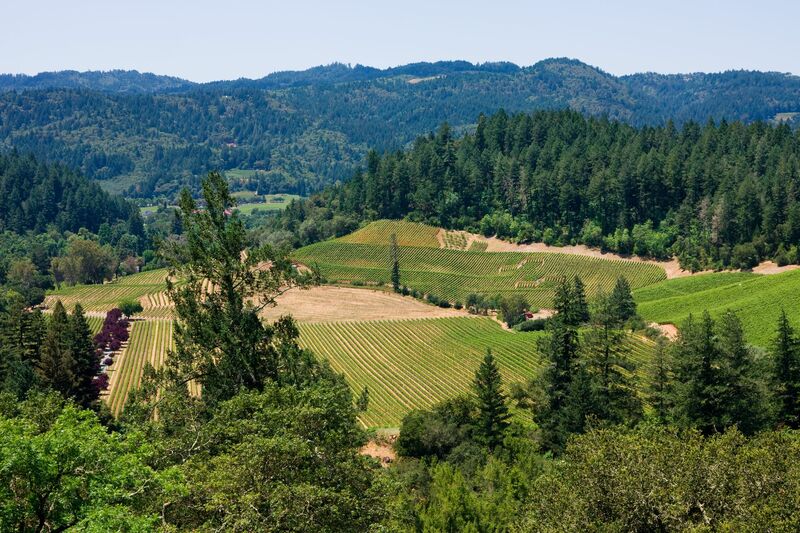 The Mayacamas Mountain Range is a short mountain range—stretching just 52 miles (80 km) in a northwest-southeasterly direction—but it is very well-known to wine lovers as the range that forms the dividing line between Napa and Sonoma counties. However, the famous Napa/Sonoma divide only accounts for about 30 miles of the famous mountains’ total length of 52 miles. Read on to see what else makes the Mayacamas Mountains famous! #1—Cobb Mountain: Cobb Mountain, peaking at 4,720 feet (1,439 m), is the highest point in the Mayacamas Range. It lies just outside of the town of Cobb in Lake County. The mountain is located outside of the range of any Lake County AVAs, but is only about five miles south of the southern edge of the Red Hills—Lake County AVA (and the larger Clear Lake AVA). This portion of the Mayacamas is responsible for the rolling hills and high-elevation vineyards of the Red Hills-Lake County AVA, which range in elevation from 1,600 to 2,500 feet (490 to 760 m) above sea level. #2—Mount Saint Helena: Mount Saint Helena, located at the boundaries of Napa, Sonoma, and Lake Counties, has five peaks that form something of an “M” shape. 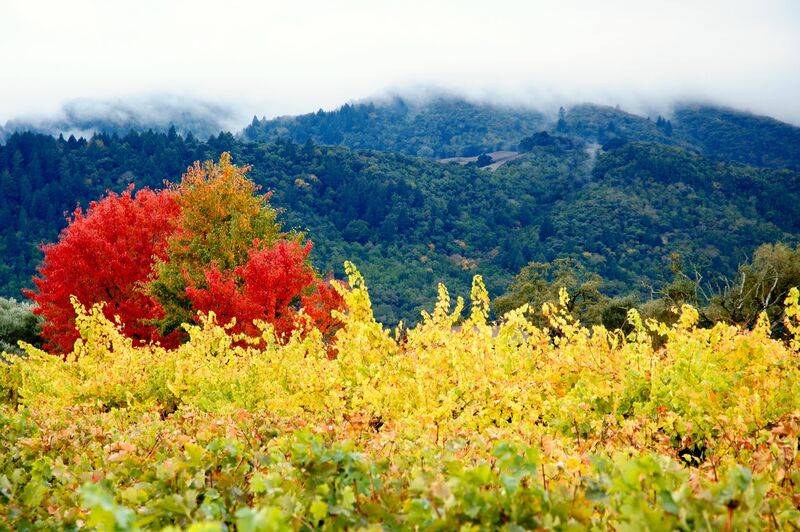 One of those peaks is located within the Knights Valley AVA and is the highest point in Sonoma County. 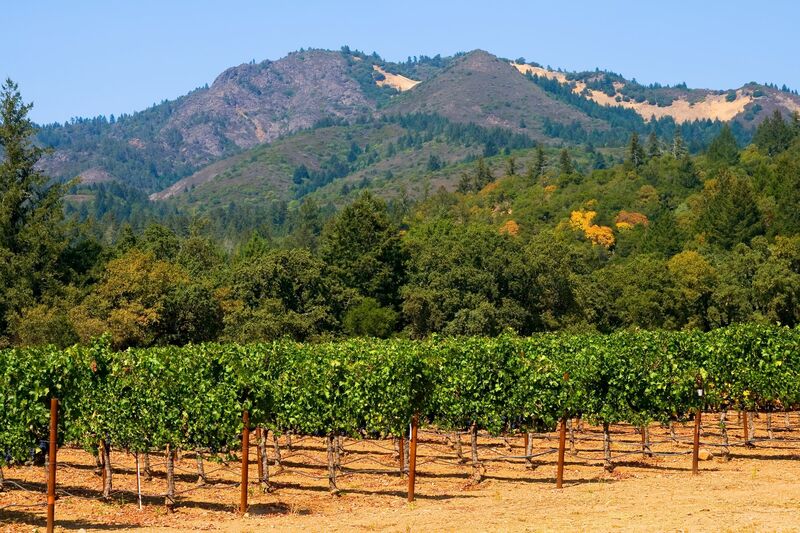 The second-tallest peak—at 4,200 feet (1,280 m)—is the highest point in Napa County (this peak is located within the Napa Valley AVA but to the north of the Calistoga AVA). Both of these peaks may be reached via hiking trails located within Robert Louis Stevenson State Park. #3—The Napa River: Mount Saint Helena is the source of the Napa River. The Napa River runs for 50 miles (88 km) from the southeast slope of Mount Saint Helena through the revered Napa AVAs of Calistoga, St. Helena, Rutherford, Oakville, Yountville, and Oak Knoll (as well as the city of Napa) before heading towards the Napa/Sonoma Marsh. The last 17 miles of the Napa River take it from the Trancas Steet bridge in Napa to the city of Vallejo through the Carquinez Straits—a long estuary bordering and empyting into San Pablo Bay. #4—The Watersheds: Towards their northern edge—just before the Mayacamas Mountains blend into the Mendocino Range in Mendocino County, the Mayacamas Mountains form the boundary between the watershed of the Russian River (as it flows south into Sonoma) and Clear Lake. This is one of the differentiating factors between the terroir of Mendocino County and Lake County. 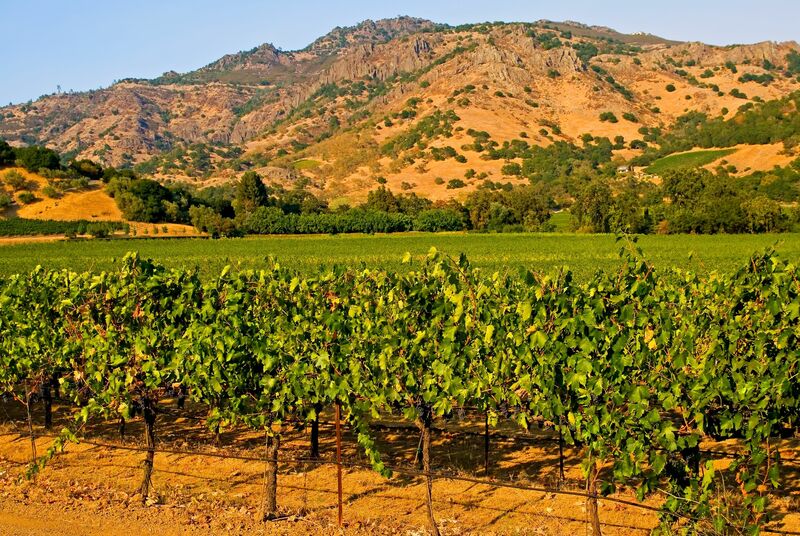 #5—The Howell Mountains: The famous Howell Mountain AVA (of Napa Valley) is actually located within a mountain range known as the Howell Mountains. The Howell Mountains blend into the Mayacamas in northern Napa just north/west of their famous namesake mountain and namesake AVA. The Howell Mountains begin just north of San Pablo Bay and form the border between the Suisun Valley (of Solano County) AVA and the Napa Valley AVA. From there, they extend to the north/northwest for about 40 miles (64 km), after which they blend into the Mayacamas. The Howell Mountains are also known as the Mt. George Range; the southern portions of the mountains are often referred to as the Napa Hills. In terms of mountainous parentage, the Mayacamas Mountains are considered to be part of the Coast Ranges of California—which (in addition to the Mayacamas Range) include the Vaca Mountains, the Mendocino Range, and the Santa Cruz Mountains. The Coast Ranges of California span for over 400 miles (640 km) from Humboldt County, through Mendocino, onward through Napa and Sonoma—all the way south to Santa Barbara County. Today is Cinco de Mayo, a day to celebrate all things Mexican, and more specifically, a day to commemorate the Mexican Army’s unlikely victory over French forces at the Battle of Puebla on May 5, 1862. Here in the USA, we typically frame our annual celebration of Mexican culture in terms of food and beverage (well, especially the beverages) so it is likely that a great deal of tequila and mezcal will be consumed today and all through the night. As such, I thought I would take this opportunity to write a post all about Agave. Agave is (of course) the amazing plant that gave us tequila and mescal, but there is so much more to know about agave. #1: Depending on how you break it down, there are somewhere between 130 and 208 species of Agave (it’s an unwieldy family that defies classification in some ways). Agave is a type of monocot (a group of flowering plants whose seeds typically contain only one embryonic leaf). Agave is native to Mexico and some parts of the American southwest, as well as parts of South America. 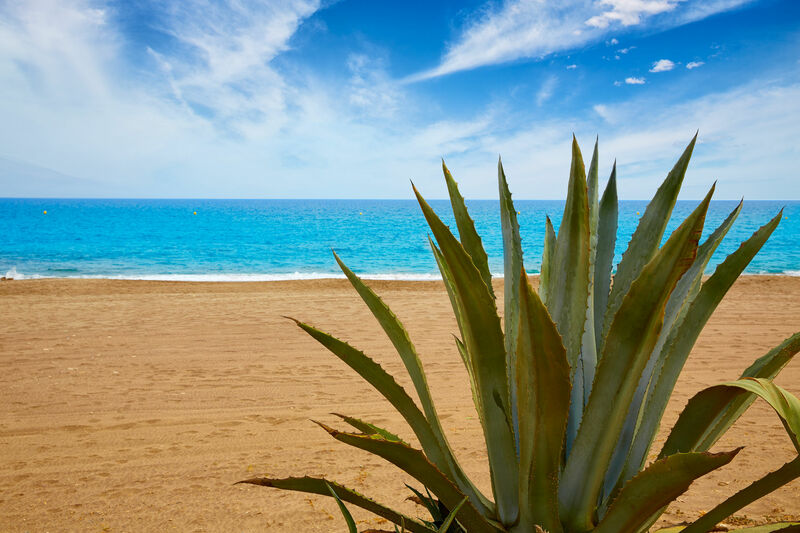 Agave has been successfully introduced to Europe and South Africa. #2: Contrary to popular belief, Agave is not a cactus, but rather it is a member of the Agavaceae family and closely related to both the lily family (amaryllis) and asparagus. Agave is, however, a succulent (loosely defined as a group of plants with thick, spongy leaves that store water). So, agave is a succulent, and cactus is a succulent, but agave is not a cactus. #4: Agave is monocarpic – meaning they die after flowering. So whether the plant is allowed to grow its flower stalk and spread its seeds, or if the flower stalk is removed to allow the stem to swell (as for use in tequila), the plant is still going to die after reaching sexual maturity. 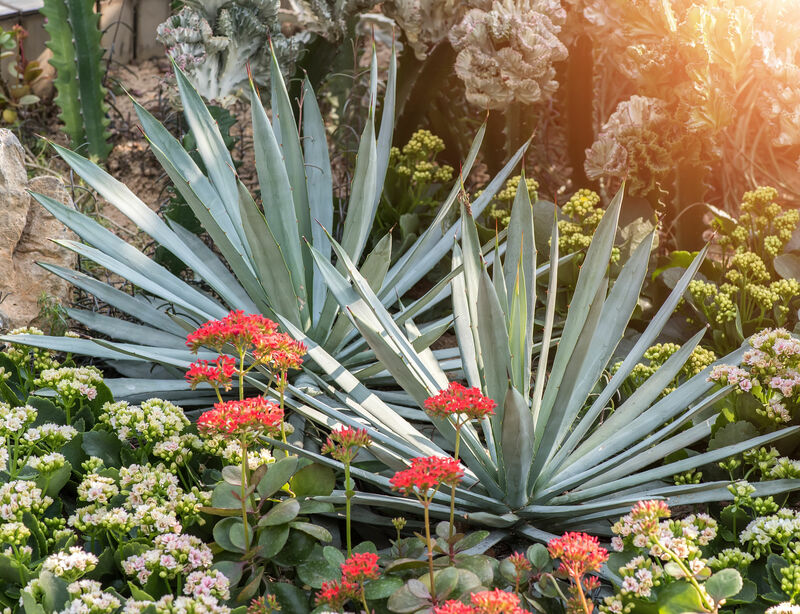 Luckily for the agave, most plants take six to eight years to reach this point, and some—such as Agave americana— take much longer. 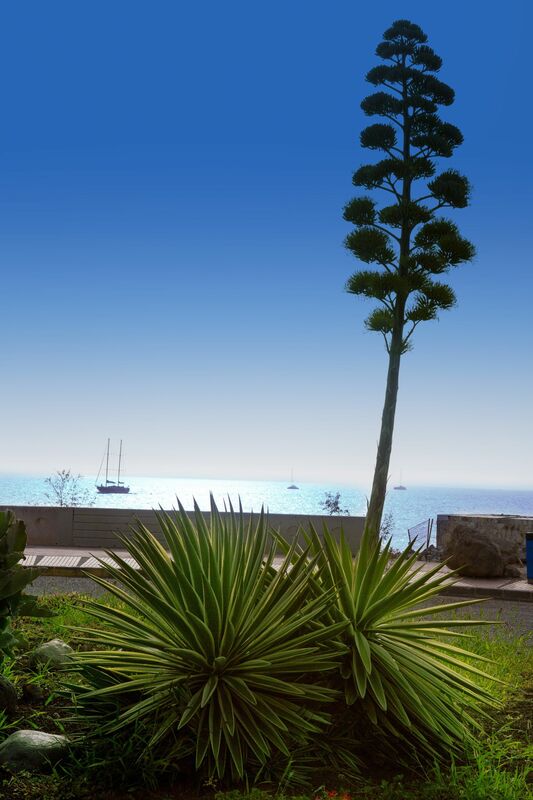 Agave americana is often referred to as the “century plant” because it supposedly takes a century to bloom, but in reality it is closer to 15 to 20 years. #5: Agave nectar (more accurately called agave syrup) is a sweetener commercially produced from several species of agave, including Agave tequiliana and Agave salmiana. Agave syrup is sweeter than honey and tends to be less viscous. Most agave syrup comes from Mexico and South Africa. Agave syrup has been marketed as a “healthful” sweetener, but this fact has been the subject of criticism due to its very high fructose content. It is, however, a true vegan alternative to honey, and – because it dissolves quickly and is sweeter than pure sugar – it is useful in (you guessed it) cocktails! One more note: If you plan on having a wee bit of tequila to celebrate Cinco de Mayo, why not step away from the sweet-and-sour-laced frozen Margarita and try a classy, classic Paloma! Click here for a recipe. A quick read about Fritz Zweigelt and the grape he created. #1 – Zweigelt is the leading red grape of Austria. It is also planted in small amounts in Canada, in both Ontario and British Columbia. 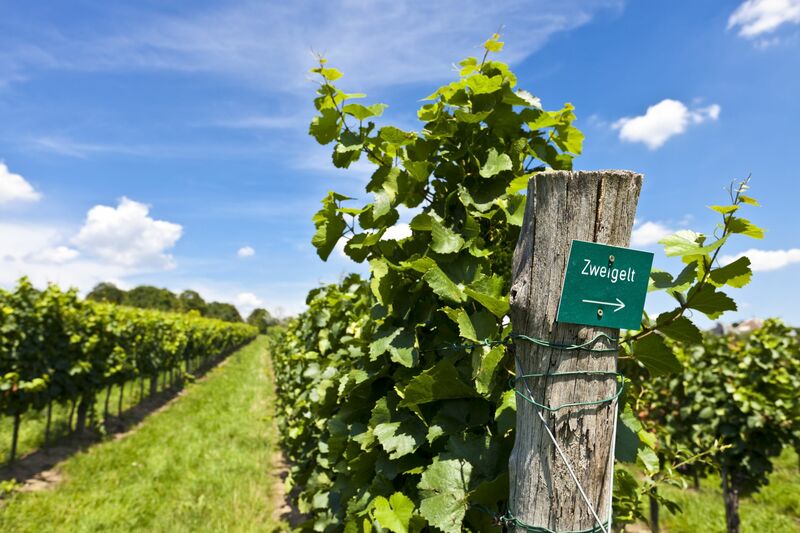 Zweigelt is the third most-planted grape of the Czech Republic, where is goes by the name Zweigeltrebe. A few wineries – including Wilridge Winery and Perennial Vintners – have some small plantings (a few acres or so) in Washington State. #2 – Zweigelt is a cross of St. Laurent and Blaufränkisch/Lemberger created by Fritz Zweigelt in 1922. Fritz was working the Federal Institute for Viticulture and Pomology at Klosterneuburg, Austria at the time, which makes the Zweigelt grape a true native Austrian. It was made with the purpose of creating a red grape unique to Austria that could thrive in the cool climate, be disease-resistant, and create a red wine of medium to full body and flavor. #3 – Dr. Zweigelt did a good job – the grape that bears his name is indeed cold-hardy, drought-resistant, and thrives in a variety of soils. It is fairly disease-resistant, but is susceptible to powdery mildew (that’s Oidium to you CSW students) and berry shrivel/grape wilt. #4 – The name of the grape is pronounced “TSVYE-gelt” – and if you think that’s difficult to say, consider yourself lucky. The original name of the grape was Rotburger (the name of a town close to where the grape was created) but was later changed to honor its creator. Zweigelt also goes by the name Blauer Zweigelt. By the way, don’t confuse the original name of Zweigelt – Rotburger – with the grape that goes by the name of Rotberger (who would – ha!). For the record – Rotberger (“berger with an e!”) is a white grape cross of Riesling X Trollinger. 5 – As with all wines, the characteristics of a good Zweigelt vary according to vineyard conditions and wine-making techniques. Cool-climate, unoaked versions from Austria’s northern reaches are typically violet-red in color, medium-bodied, and moderate in tannins with fruit-forward flavors favoring red and black cherry. As such, it is the most widely consumed red wine in the pubs, bars, and casual restaurants in and around Vienna. 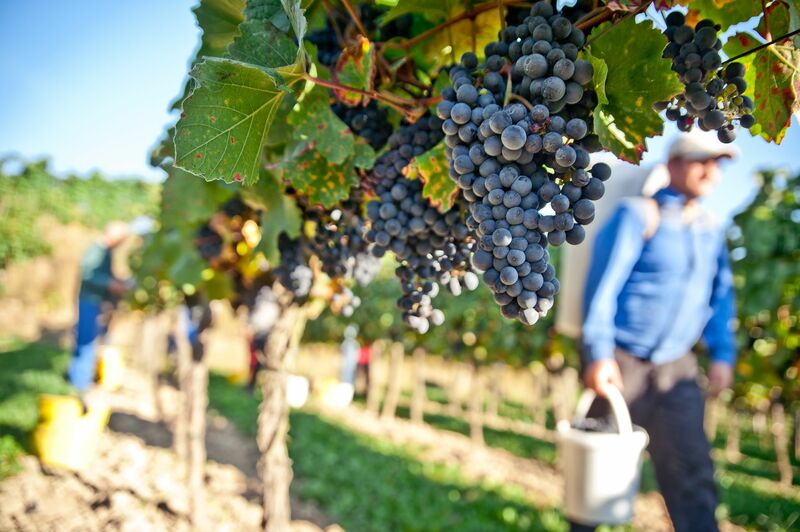 The warmer growing regions in the areas of Lower Austria (Niederösterreich) – particularly Neusiedlersee – produce full-bodied, richer wines with firm tannins. Such wines are often oak-aged, resulting in flavors of red cherry, red plum, cinnamon, and black pepper. Ok, I apologize for the gratuitous alliteration, but you have to admit…flor – the indigenous yeast cells that form a “veil” on the surface of certain types of Sherry as it ages – is fascinating. Flor (meaning “flower” in Spanish) is a subject that just seems to get more interesting the closer you look. As a matter of fact, I had a hard time limiting the information I found to just five facets! #1: Flor is what separates the Finos from the Olorosos. Flor is a film-forming yeast (actually, several related strains of yeast) that is indigenous to the region around the Jerez-Xérès-Sherry DO. Flor is the main factor that causes the myriad types and styles of Sherry to divide roughly into three camps – Fino, Hybrid, and Oloroso – based on the extent of flor influence. Fino Sherries (such as those labeled as Fino or Manzanilla) are aged under the somewhat constant influence of flor. Oloroso Sherries (labeled as Oloroso or sometimes as Cream Sherry) are aged entirely without flor; while hybrids (such as Amontillado and Palo Cortado) are aged partially with flor and partially without. #3: Flor protects the wine from oxidation in a variety of ways. The veil that is created via the action of flor protects the wine resting beneath it in a myriad of ways. For one, it simply forms a protective barrier between the wine in the barrel and the oxygen above it. In addition, the flor actually consumes some of the oxygen around it, as well as some of the alcohol, glycerol, and (if present) sugar. 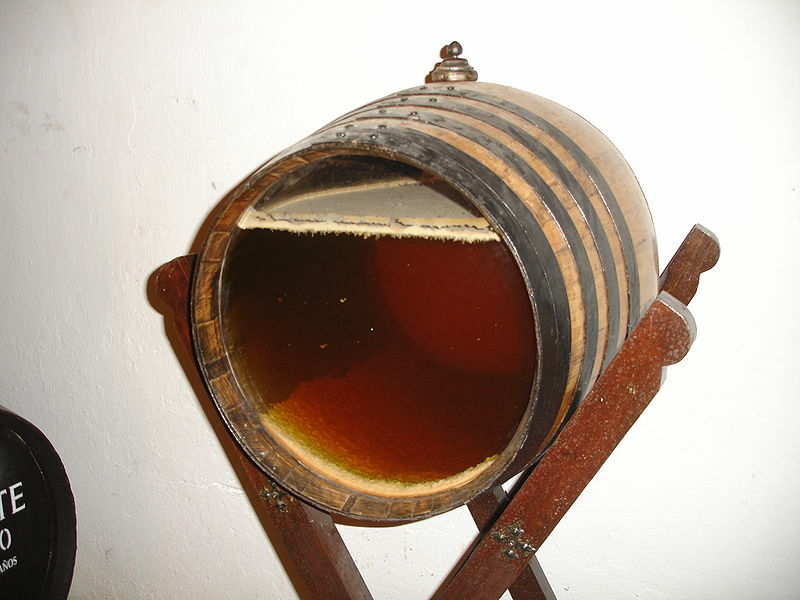 Thus, Fino Sherries tend to be pale in color, light in body, and bone-dry. #4 – The collective effects of flor – referred to as “biological aging” – are amazing. The main benchmark for biological aging is considered to be the wine’s aroma. Simply put, contact with flor (both while it is alive, and after it expires and sinks to the bottom of the barrel as lees) may create up to 1,000 milligrams per liter of acetaldehyde in the wine. That is, according to Ruben Luyten of the blog Sherry Notes, more than twenty times the amount of acetaldehyde found in most table wines. Acetaldehyde’s aromas have been described, variously, as rancid apple, apple cider, almond, hazelnut, and even straw or hay. The presence of flor will also lead to an increase of in other highly aromatic compounds, such as lactones and terpenes, which may add an array of aromas – from dried herbs to green walnuts, mushrooms, and baking spices – to the wine. #5: Flor has some definitive preferences as to climate and conditions. Flor can only survive in wine that has an alcohol level of somewhere below 15% abv – but that’s just the beginning of its ways. Flor also needs a good deal of humidity in the air, which explains why Fino Sherries thrive in certain areas, such as the cooler, coastal areas around Sanlúcar de Barrameda and El Puerto de Santa María, while Oloroso Sherries (which are aged without flor) thrive in the hotter, drier, more inland areas around Jerez. It is well-known that solera systems (and the buildings that surround them) are often at ground level (as opposed to an underground cellar) and built with high ceilings or even left partially open to the elements, so as to encourage air flow. It’s also rumored that bungs are left gently in place in Fino Soleras to encourage the movement of the humid air inside the barrels. While wines produced “under a veil” are somewhat uncommon around the world, there are a few shining examples besides Fino Sherries. 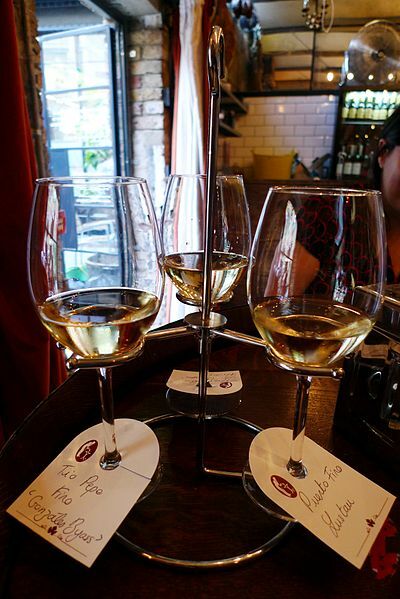 These include the Vin Jaune of France’s Côtes du Jura AOC, certain types of Tokaji, a “Vin de Voile” produced by Domaine Plageoles in France’s Gaillac region, and the “Condado Pálido” produced in Spain’s Condado de Huelva DO, among others. While these wines undergo a similar style of biological aging, it is not certain that they use the same strain(s) of yeast as are found in Jerez-Xérès-Sherry, and, of course, each of these wines is made in its own conditions of climate-atmosphere-terroir. Thus, we can safely say that there’s nothing in the world quite like the flor of Jerez, the protective foam-blanket it creates, and the resulting Fino Sherry.